WASHINGTON -- Judy Stratton said she and her husband Harry have tried since January 2009 to modify the mortgage on their home in Stayton, Ore. after a drop-off in demand for Harry's floor maintenance services. In August, Stratton said, they received a rejection letter from their bank saying they did not qualify for help per the Obama administration's Home Affordable Modification Program. "This was a lie -- 100 percent lie," Stratton said. "We ran off the guidelines. We met every single qualification to get a HAMP mod." Nevertheless, Stratton said a foreclosure sale is scheduled for Nov. 24 on the home they've lived in for the past 10 years. She reached out to her friend Peggy Merrill, who attends the church where Stratton is music director. "I got together with Peggy and I was in tears: 'We're losing our house over a pack of lies!'" Merrill started doing some research into HAMP and did not like what she learned. "I was concerned about their house, but the more I got into it -- it's my tax money, $75 billion worth," Merrill told HuffPost. "It's just a scam and the banks are getting everything." So they took to the streets. Merrill helped the Strattons organize what might have been the first grassroots anti-HAMP protest on Friday and Saturday. 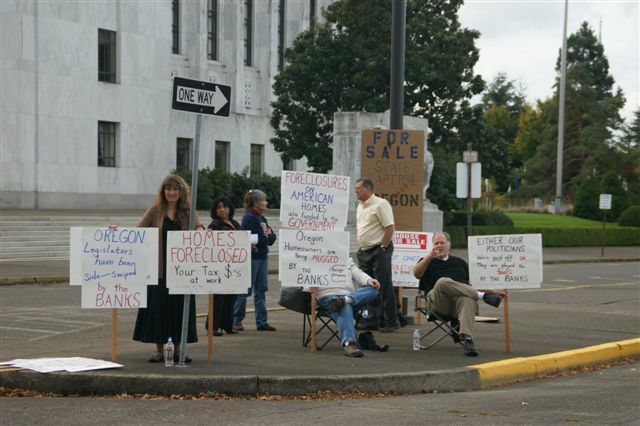 A group of six people picketed outside the state capitol in Salem, Ore. for six hours each day with signs that said things like "HOMES FORECLOSED - Your Tax $'s At Work." 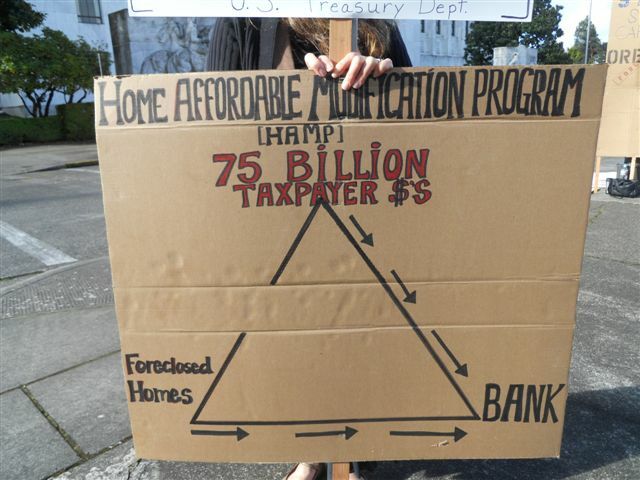 HAMP was initially funded with $50 billion in Wall Street bailout money and $25 billion from taxpayer-owned Fannie Mae and Freddie Mac. Struggling homeowners are supposed to be eligible for the program if they live in their home, owe less than $729,750, and their mortgage payments amount to more than 31 percent of their monthly income -- and they have to prove it. Qualified borrowers who successfully make three months of reduced "trial" payments are supposed to be put into five-year "permanent" modifications. It often doesn't work out that way, as mortgage servicers lose paperwork and homeowners discover that the foreclosure process has moved faster than the trial process. President Obama said the program would help three to four million people modify their mortgages. But through September, 728,686 struggling homeowners have been kicked out of the program; just 640,300 remain, the Treasury Department reported on Monday. In a separate report on Monday, a federal watchdog said that some people who apply for HAMP "end up unnecessarily depleting their dwindling savings in an ultimately futile effort to obtain the sustainable relief promised by the program guidelines," and that "even in circumstances where they never missed a payment, they may face back payments, penalties, and even late fees that suddenly become due on their 'modified' mortgages and that they are unable to pay, thus resulting in the very loss of their homes that HAMP is meant to prevent." Judy Stratton said she has reached out to her congressman and her senators but she doesn't know what to do next. She said, "My gosh -- there's no help."